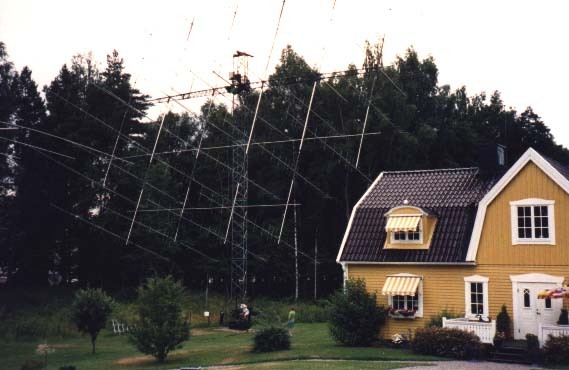 In the summer of 1999 I and Kjell, SM7GVF took a trip to SM5FRH, Tobbe. For a look at his eme-stn and some socializing between us emers. It was a very interesting trip indeed. I was very impressed of the huge echoes from Tobbes eme-stn. Here is Tobbes array and the house. Can you see Kjell and Tobbe under the array? The array is 32 x 19 el horisontal and the antennas has 10 el vertical too. Tobbe uses stereo RX with a Yaesu FT-1000D and two transverters. Left: SM7GVF, Kjell. 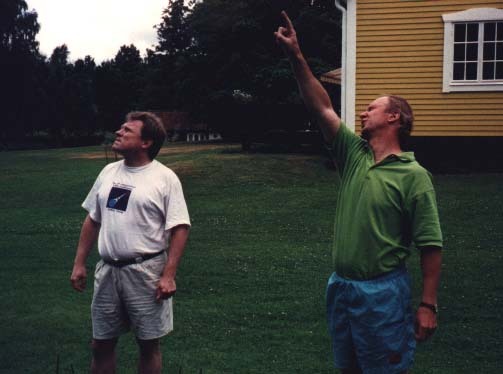 Right: SM5FRH, Tobbe. Discussing some antenna-stuff. Tobbes QTH and ham-stn is really UFB, tnx for letting us come and visit. Now I am off to the bank for a loan so I can build a big array! hi hi.